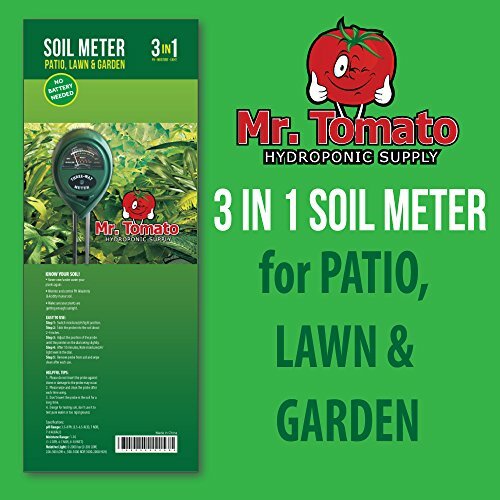 Mr Tomato Soil pH Meter, 3-in-1 Soil Moisture, Light and pH Meter, Perfect for indoor Hydroponics or Outdoor Planting. Product prices and availability are accurate as of 2019-03-20 11:58:15 EDT and are subject to change. Any price and availability information displayed on http://www.amazon.com/ at the time of purchase will apply to the purchase of this product. 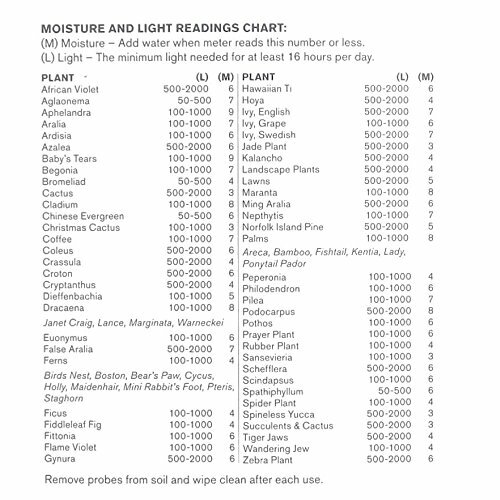 IF YOU WANT YOUR PLANTS TO THRIVE-You must have accurate information about the plant's environment, including how much light it is receiving, the moisture level of the soil and its Ph level. Our all-in-one meter accurately tells you all three. EASY TO USE- Just move the switch to the reading you need, place the probes in the ground and wait 10 minutes. Change the switch to get the other readings. Bingo! You now know everything you need to care for the plant correctly. NO MORE GUESSWORK- Is it time to water or is it too moist already? Is it getting enough light or too much light? 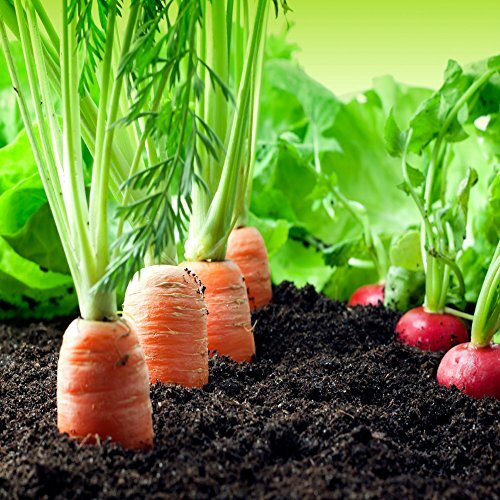 Is the soil the correct pH or do you need to add something to the soil? With our easy-to-use tester, you'll have all the facts you need - no more guessing. NO BATTERY NEEDED- Our 3-in-1 tool works on the principle of electrical conduction and needs no battery. COMPACT DESIGN- Fits in a shirt pocket. Designed for indoor and outdoor use. If you are serious about gardening, you know that you must have clear, accurate information to make the right decisions in caring for your plants. 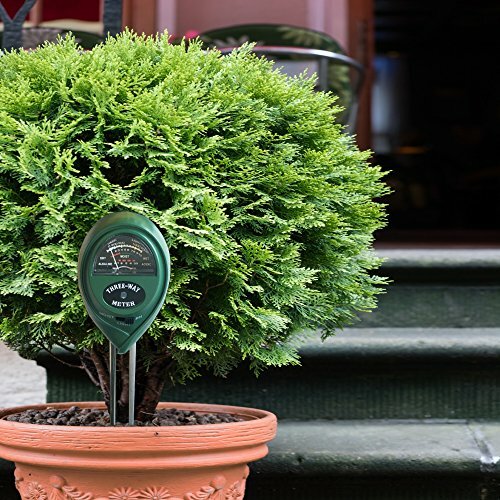 The 3-in-one tester gives you that information to help you have the most beautiful garden in the neighborhood. 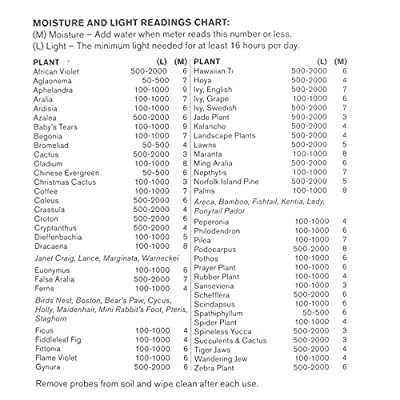 IF YOU WANT YOUR PLANTS TO THRIVE-You must have accurate information about the plant's environment, including how much light it is receiving, the moisture level of the soil and its Ph level. 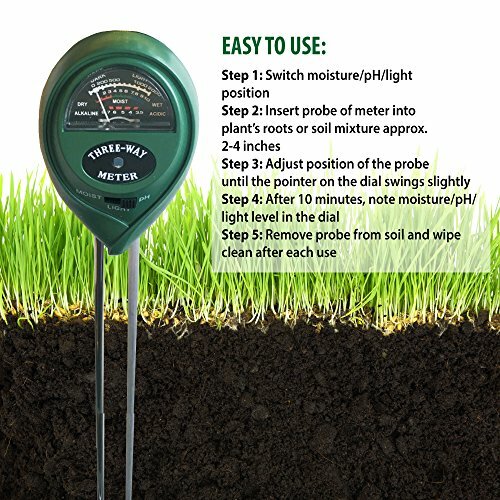 Our all-in-one meter accurately tells you all three. EASY TO USE- Just move the switch to the reading you need, place the probes in the ground and wait 10 minutes. Change the switch to get the other readings. Bingo! You now know everything you need to care for the plant correctly. NO MORE GUESSWORK- Is it time to water or is it too moist already? Is it getting enough light or too much light? 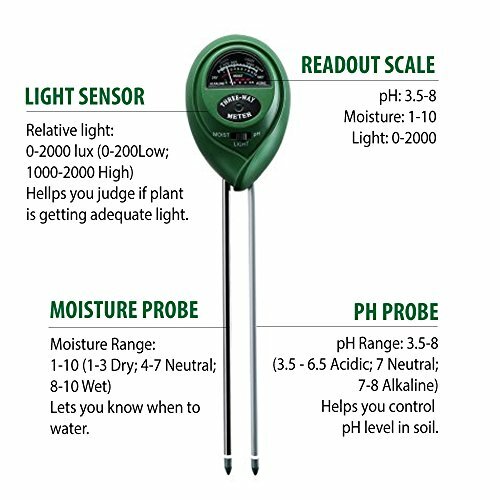 Is the soil the correct pH or do you need to add something to the soil? With our easy-to-use tester, you'll have all the facts you need - no more guessing. NO BATTERY NEEDED- Our 3-in-1 tool works on the principle of electrical conduction and needs no battery. COMPACT DESIGN- Fits in a shirt pocket. Designed for indoor and outdoor use.